In all the commemorations for the centenary of World War One it is unlikely that there will be many references to the huge strike wave that preceded the war. But this strike wave, known as the Great Unrest, created considerable insecurity among Britain’s elites. This was especially the case as these strikes coincided with other disturbing social movements such as the nationalist upsurge in Ireland and the increasingly violent campaign for women’s suffrage. Britain faced no serious threat of invasion in 1914. Nevertheless, having seen the male youth of France and Germany rush to war, Lloyd George was very concerned that the British male should also act like a ‘real man’ so that Britain would not end up as ‘the only land whose children are not prepared to sacrifice themselves for [their nation’s] honour.’ In a similar vein, the Prime Minister, Asquith, argued that ‘no self-respecting man could possibly have repudiated’ Britain’s obligation to defend Belgium. Meanwhile, in Germany, Kaiser Wilhelm was even more anxious not to be seen as unmanly, insisting that ‘this time I shall not chicken out,’ while his Chancellor, Bethmann-Hollweg, said that for Germany to have backed down in 1914 would have meant ‘self-emasculation’. For these politicians, this defence of male honour, combined with the defence of their countries’ Great Power status, was crucial for maintaining respect and authority at home as well as abroad. No British politicians were as explicit as the Prussian conservative leader who said that ‘a war would strengthen patriarchal order’ or the German military leader who said that a war was ‘desirable in order to escape from difficulties at home and abroad.’ But, when war in Europe seemed inevitable both Asquith and Churchill immediately saw it as a relief from domestic conflict – a way to ‘escape from Irish troubles’. Unfortunately, working class men also saw war as a way to both assert male honour and to give them a sense of purpose and community without having to make a revolution. Consequently, politicians like Lloyd George soon began enthusing wildly about the ‘new patriotism’ that was so effectively motivating millions to fight and die for their governments rather than fighting to overthrow them. Of course, this counter-revolutionary strategy could only work as long as governments had a hope of winning the war. Failure to provide this hope, or to provide people with sufficient food, could easily create the conditions for revolution and, as the war dragged on, many working class women started protests and food riots right across Europe. Such protests were particularly effective in Petrograd where female workers spread the idea of a general strike on International Women’s Day, 1917. On that day, 8 March, hundreds of women dragged their fellow male workers on to the streets and in a few days the Russian Tsar had abdicated and his regime had collapsed. Fearing the spread of what he called a ‘new enemy, more dangerous than the Entente: international revolution’, the Austrian Emperor immediately proposed ending the war. The German Kaiser, however, was determined to keep fighting, fearing that if his government made peace without victory then that would only exacerbate any revolutionary tendencies. Unfortunately, this cynical use of both war and peace to counter any threats of revolution was very effective and the workers’ revolutions in Germany and Russia were soon contained and repressed. However, a decade later, the unemployment and austerity of the Great Depression put European revolution back on the agenda. This situation then compelled the German capitalist class to revive the militarism and national unity of 1914 by letting the Nazis take power. Britain and the US still feared competition from a revived German imperialism. But they were hesitant to push their own reluctant populations into a repeat of the 1914-18 land war with all its mutinies and revolutions. Consequently, they held back from invading France and, instead, prioritised the bombing and blockading of German civilians for much of World War Two. By 1945, the two world wars had successfully decimated and redisciplined much of the world’s working class. The US and the Soviet Union then maintained this discipline by keeping the world in a constant state of Cold War. However, by the 1960s, once they realised that the Cold War was unlikely to lead to a nuclear war, workers became increasingly free of wartime discipline. American soldiers in Vietnam refused to fight and some even killed their own officers. US failure in the war, combined with widespread strikes, as well as with black and feminist rebellions, then encouraged a growing anti-capitalist consciousness. Western governments now had little choice but to roll back state provision and introduce mass unemployment in order to make workers think twice about going on strike. By relaunching the Cold War in the 1980s, these governments were also able to rediscipline workers while, at the same time, maintaining investment in industry through massive military spending. This whole counter-revolutionary strategy was, again, very successful. But it could not last. When the Soviet Union collapsed and the Cold War ended, capitalist investors then neglected industry in favour of finance. This led inexorably to the crisis of 2008 which, in turn, led to today’s economic policy of seemingly endless austerity. Such a policy has, so far, been very effective at demoralising and demobilising people. But, without a global confrontation on the scale of the Cold War, it has little chance of long-term success. Throughout the 20th Century, no government, whether fascist, Stalinist or Thatcherite, could successfully impose austerity on people without also distracting and uniting them through a constant state of war emergency. The Cold War was ideal for this. But all attempts to revive the Cold War in the 21st century as the War on Terror have resulted in failure. Despite the brutality of the invasions of Afghanistan and Iraq, international opposition did deter the US military from bombing people on the scale of the Korean and Vietnam wars. At the same time, however, the US population's reluctance to sacrifice its soldiers compelled the US military to use a level of violence to protect its personnel that only increased opposition to the American presence. Unable to bomb people into submission or to win their support, US defeat was inevitable. This defeat later helped to encourage the Arab Spring uprisings across the Middle East. Unfortunately, counter-revolutionary repression and civil war have, so far, crushed these uprisings. But the US and other Western governments still need to use troops on the ground to stabilise these counter-revolutions and people’s reluctance to sacrifice any more soldiers makes that an extremely risky proposition. Unable to unite their populations around wars in Iraq, Iran or Syria – let alone the Ukraine – Western politicians are, instead, keen to commemorate the national unity and futile sacrifice of past wars in a desperate attempt to pretend that we really are ‘all in this together’. With no concession to any historical truth, Barack Obama has praised the ‘profound sacrifice’ that Allied soldiers made in 1914-18 ‘to fight and die for the freedom we enjoy’. Meanwhile, David Cameron was so fixated on the idea of the sacrifice that British soldiers ‘made for us’ that he used the word ‘sacrifice’ eight times in one commemoration speech. Fortunately, if Britain, with its strong military traditions, cannot tolerate the sacrifice of 179 soldiers in Iraq, then no Western societies are likely to tolerate the sacrifice of vastly greater numbers in any new global war. Nevertheless, the Western ruling class are still hoping that people will agree to sacrifice their living standards in order to compete with workers in Asia and so, somehow, rejuvenate Western capitalism. Such a sacrifice, such a ‘race to the bottom’, would be less bloody than the inter-imperialist competition of 1914-18, but no less pointless. As in the early years of the Great War, people will go along with government propaganda for a while but – eventually – they will realise that they are sacrificing their lives for nothing. Then it may only be a matter of time before we see social unrest comparable to that of the Great Unrest. And, this time, our rulers will have serious problems containing any such unrest because there is no easy way to divert people’s energies into war as there was in the Cold War – or in the Great War. The British Government’s desperate attempt to revive what Cameron called the ‘national spirit’ by commemorating the monstrous slaughter of 1914-18 is a good opportunity to expose the real history of capitalism and its counter-revolutionary wars. See therealww1.wordpress.com for information about future events and for more anti-war articles. 1) K.Marx, ‘The Civil War in France’, ch.6. Marx’s earlier views on war were more ambiguous than this statement. But ‘The Internationale’, also written in 1871, was very clear about war and includes the lines: ‘Peace between us, war to tyrants! Let the armies go on strike.’ A later British version then includes the lines: ‘And if those cannibals keep trying, To sacrifice us to their pride, … We’ll shoot the generals on our own side!’ Wikipedia: ‘The Internationale’. 2) B.Millman, ‘Managing Domestic Dissent’ p36; P.Thompson, ‘The Edwardians’ p168. H.G.Wells also argued that the British worker now ‘ceases to believe in the law, ceases to believe in Parliament’ and that this worker was ‘beginning now to strike for unprecedented ends – against the system, against the fundamental conditions of labour.’ H.G.Wells, ‘An Englishman Looks at the World’ p60, 44-6. 3) A.Hochschild, ‘To End all Wars’ p70-1; S.Hurwitz, ‘State Intervention in Britain’ p27-57. In 1920, Ernest Bevin said that without the war there would have been ‘one of the greatest industrial revolts the world has ever seen’. ‘Parliamentary Papers’ v.24, HMSO p495. 4) Lloyd George also argued that the nation needed ‘to call forth its manhood to defend honour and existence’ and he claimed that Russia’s decision to attack Austria ‘gave the only answer that becomes a man’. Lloyd George, ‘From Terror to Triumph’ p ix, 1, 9, 50-7; D.Welch, ‘Justifying War’ p98; I.Hull, ‘The Entourage of Kaiser Wilhelm II’ p238, 265; H.Afflerbach, ‘An Improbable War’ p245-50; M.Micale, ‘Hysterical Men’ p162-70; B Silver, ‘Forces of Labor’ p126, 138-41; J.Morrow, ‘The Great War’ p16-18, ch.5, ch.6, p297-8. 5) Hull p259; M.Neiberg, ‘The World War 1 Reader’ p309; Hurwitz p42; W.Mommsen, ‘Central European History’ v.6 p36-43; M.Bric, ‘From Political Violence to Negotiated Settlement’ p47. Britain’s attempts to mediate peace in July 1914 were very half-hearted. Churchill wrote that: ‘We all drift on in a kind of dull cataleptic trance. As if it was somebody else’s operation!’ Despite their preference for peace, Britain’s leaders were incapable of restraining their militaristic tendencies and on the same day that he wrote these words Churchill ordered the British fleet to war stations. This was an action that risked encouraging France and Russia to provoke war, an action that he and Asquith decided before they knew of any war declarations in Europe and an action that Churchill knew could be considered as ‘likely to damage the chances of peace’. Of course, many liberals were less belligerent than this and some even feared that war might lead to revolution. But to really restrain the war-mongers, these liberals would have needed to ally with the labour movement in a way that might itself have encouraged revolutionary change – and that was hardly an attractive option for liberals. D.Newton, ‘The Darkest Days’ p25-30, 50-4, 141-4, 228-9, 286-310; M.Gilbert, ‘Winston Churchill’ p266-8; A.Nevins, ‘Henry White’ p257-8. Earlier, Lloyd George’s ministerial colleague, Edward Grey, had been so worried about revolution during the Great Unrest that he suggested that workers ‘must share in control’ of capitalist industry. However, Grey was also worried that the unions may ‘push things too far’ and that if the capitalists were ‘too unyielding, there will be civil war’. Now, in 1914, Lloyd George was discovering that the national unity of wartime made it possible to introduce social reform, and so stabilise capitalism, without risking revolution or civil war. Lloyd George p14; Hochschild p92; K.Wilson, ‘The Policy of the Entente’ p13. 8) N.Hollander, ‘Elusive Dove’ p173; E.Ludendorff, ‘The General Staff’ v.2 p420-6. The Kaiser’s views were backed up by nationalist politicians who argued that the German people needed a victory with territorial expansion ‘to distract them from internal dissension’, otherwise ‘revolution would be only a question of time.’ Indeed, as early as 1916 the German authorities were reporting that, even though union leaders were doing 'everything possible to prevent … disturbances and strikes over food provisions, ... it is the countless female workers who constantly agitate and stir things up.' Hull p276; U.Daniel, ‘The War from Within’ p293, 246-50. 9) B.Millman, ‘Pessimism and British Policy, 1916-1918’ p61; D.French, ‘The Strategy of the Lloyd George Coalition’ p119-122, 92-3, 146. In 1917, Lord Esher said that he had met no one who differed from his view that if Britain made a peace without victory, ‘then we shall be lucky if we escape a revolution’. Meanwhile, in Italy revolution was even more imminent and it was only by sending both troops and food that the Allies were able to contain the situation. H.Goemans, ‘War and Punishment’ p221; J.Winter, ‘The Great War in History’ p139. 10) D.Moran, ‘The People in Arms’ p128-9; Hull p253-4, 275-6; Goemans p106ff., 261-5; A.Read, ‘The World on Fire’ p37-8. 11) T.Ben-Moshe, ‘Journal of Modern History’ v.62 p504, 529-36. 12) Hillel Ticktin, ‘Marxist Method, Working Class Struggle...' and 'A Marxist Political Economy of Capitalist Instability… ’. 13) B.Obama, speech 26/3/14; D.Cameron, speech 11/10/12; Wikipedia: ‘Iraq War’. Cameron also repeated the 1914 propaganda lie that British soldiers went to war to counter ‘[Prussian] atrocities in Belgium’. Such atrocities were all too real but they were hardly the motive for war and hardly worse than Britain’s use of concentration camps in the Boer War (or her naval blockade which contributed to the deaths of over half a million civilians in WW1). ‘The Telegraph’, 18/12/13; A.Downes, ‘Targeting Civilians in War’ p87. Despite all the setbacks of the present period, young people’s disrespect for authority, and their desire for both individuality and gender equality, make any return to the militarism of 1914 highly unlikely. War is a humbug, intended to defer the struggle of the classes." 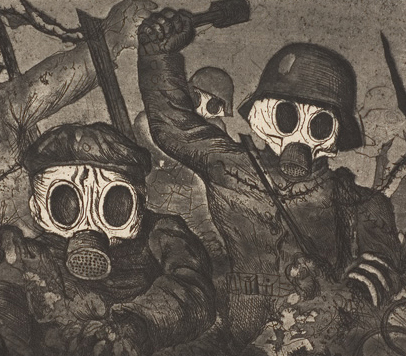 The powerful image at the start of this article is taken from Otto Dix's 'Stormtroops Advancing Under a Gas Attack'. German anti-war propaganda was also particularly powerful. Gerd Arntz left-communist 'cartoons' can be found HERE. Even more powerful pictures from anarchist, Ernst Friedrich's anti-war exhibition can be found here: 'WAR against WAR'. 'Life on the eve of war: the workers unite', Daily Telegraph. '1913 - The Year Before', Michael Portillo, BBC Radio 4.